Darsan Contracting offers complete landscape design and landscape construction services. Darsan's knowledgeable and experienced landscape designers will provide you with an innovative and impressive landscape design that will serve as the framework for your successful landscape project. The landscape design process will start with an initial on-site consultation, during which we will talk to you about your own specific requirements and personal wishes. Our landscape designer will go through Darsan’s portfolio of past works, giving you an idea of the available materials, quality workmanship and different design styles. We will analyze the existing site conditions, assess the scope of work, and provide you with a design fee quotation. When you are ready to proceed, we will make arrangements to photograph the property and take site measurements. Our landscape design services are especially comprehensive. Inspiration comes from the unique attributes of the home’s architecture as well as existing structures, conditions, views, and nature. Aesthetics form and function will be taken into consideration while developing possible concepts. We employ meticulous plans that are printed to scale and hand coloured. All hardscape and recommended plant material are labeled. A detailed landscape construction quote will be provided to you upon presentation of the master plan. Once the landscape design and construction quote is approved, a contract will be signed and start dates will be scheduled. The final product will be your dream yard and your family’s oasis. Your yard will become a beautiful, functional, outdoor living space that will be a source of pleasure for many years to come. We build our reputation on experience, quality of work, and great customer service. Darsan Contracting provides full service landscape consultation, landscape design and landscape construction. 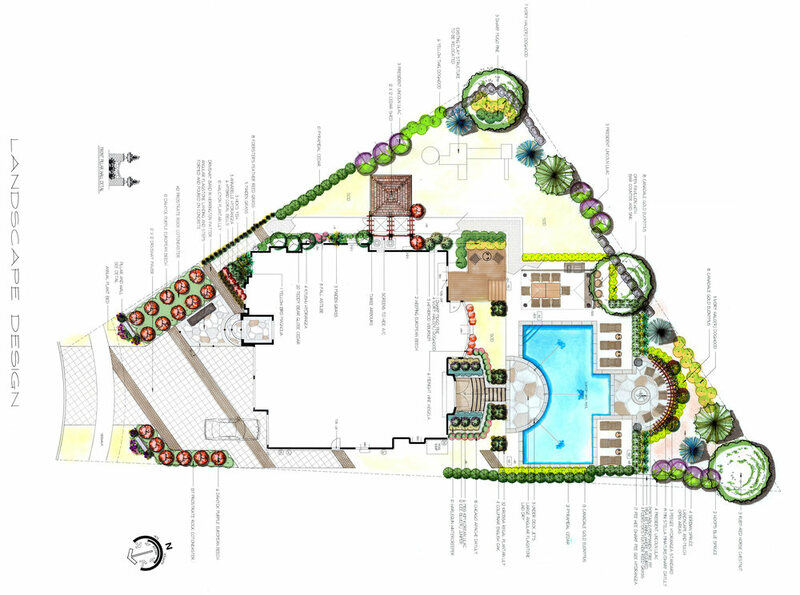 A successful landscape project always starts with a well thought out landscape design. Darsan’s award winning landscape designers will provide you with a custom landscape design that will maximize the potential of your outdoor living space. The landscape designers at Darsan Contracting will listen carefully to your wants and needs. They work closely with you through the design process to develop a final master plan that reflects your unique personality and lifestyle. Our group of experts collaborate to ensure that the concept stage evolves into an aesthetically pleasing and functional environment. 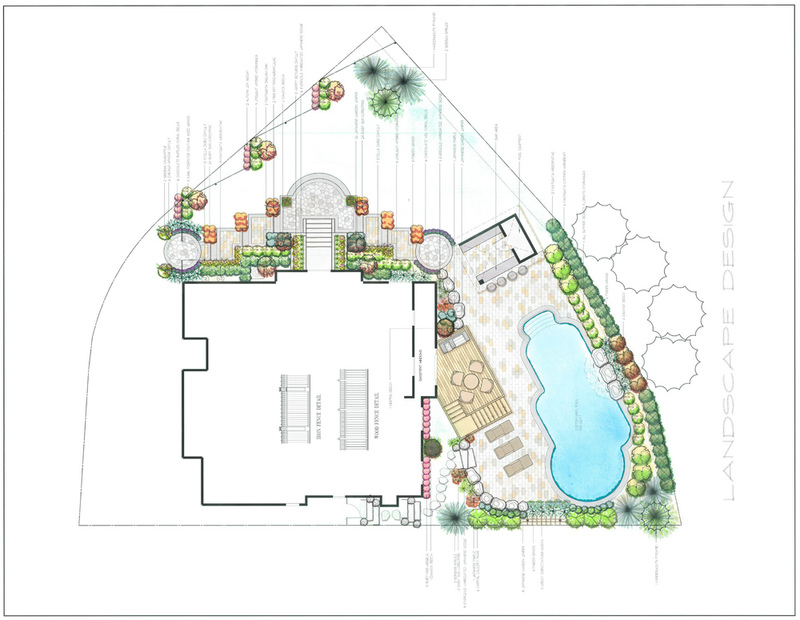 Our landscape design package includes a final landscape design that is labelled, printed to scale, and hand coloured. We also offer landscape design packages that may include fully rendered 3D plans, inspirational pictures and plant care packages. When you hire Darsan Contracting, the finished product will portray the vision the landscape designer and the homeowners imagined. Darsan Contracting offers Swimming Pool Design and Landscape Design services, creating outdoor living spaces that are customized to suit your personal lifestyle. Your yard will become a beautiful functional outdoor living space that will be a source of pleasure for many years to come. When you purchased your home you inherited the existing garden. It is either one that the builder has put in place or one that the former owners have created. The property may not be utilized to its full potential, the design may not suit your style, or occasionally you will start with a blank slate. Whatever the case may be Darsan’s team of landscape designers, stonemasons and carpenters will transform your ideas and dreams into reality. With any landscape design project that we undertake, we will analyze the existing grades, drainage, light, soil and site conditions. Every detail in the landscape design is considered important. If you have decided to incorporate a swimming pool into your landscape design, we will assist you in making decisions on the type of pool, size and shape that will suit your property, needs, style and budget. By creating innovative and unique swimming pool designs and implementing industry leading construction techniques, we will develop the backyard retreat you've been dreaming of. Customized Carpentry structures can be elegant but simple, or elaborate and luxurious. There are numerous options to choose from. Let Darsan’s Landscape Designers help create and bring your vision to life. Specialized garden lighting will enhance landscape features, provide visibility, create an ambiance and extend your entertaining and enjoyment into the evening. A landscape lighting plan can include spot or up-lighting, down lighting, and a combination of low voltage and 120 V line voltage. Irrigation systems will protect the beauty of the trees, shrubs, perennials and lawn by using the right amount of water in all the necessary areas.